Fairhaven, Massachusetts has some beautiful old buildings and I feel quite lucky to live in such a quaint and historic town. This is Center Street. What you can see here are two of the town's gorgeous churches; one has actually been converted into a private home! The Fairhaven Town Hall is nestled between them. 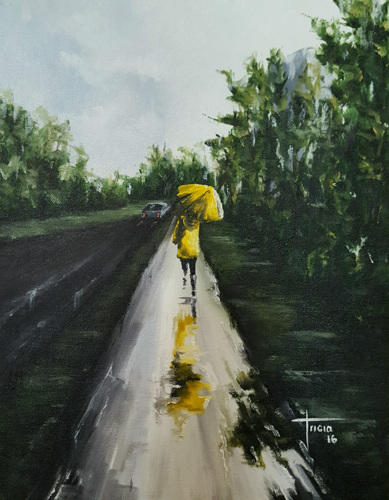 I am so fond of 'rainy day' paintings! It may be my favorite new obsession. Can you just feel the damp chill in the air? My husband really wanted to see the Kentucky Derby. (It is one of his 'bucket list' things.) I am so very thrilled to say that we attended in 2015 and were lucky enough to witness American Pharoah win the first jewel in the Triple Crown! I admit that I wasn't really that interested at first, but I got so caught up in the excitement. I am now a huge fan. 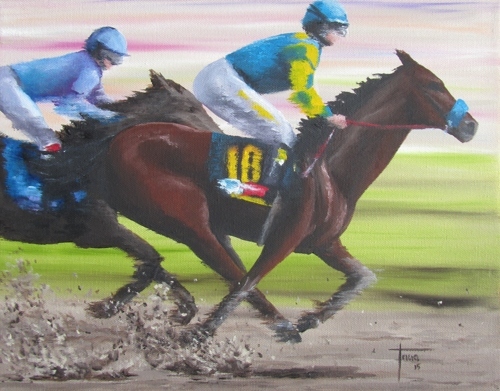 I was inspired to paint this piece and actually finished it just days before this amazing horse won the Belmont Stakes and the Triple Crown. 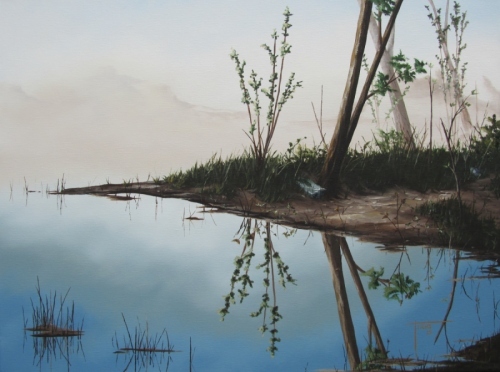 This is a very tranquil piece depicting a still lake and the plant life reflecting in it. The feeling of calm is intense. The water is frozen in time and the quiet is surprisingly deafening! To see this painting please contact me directly. 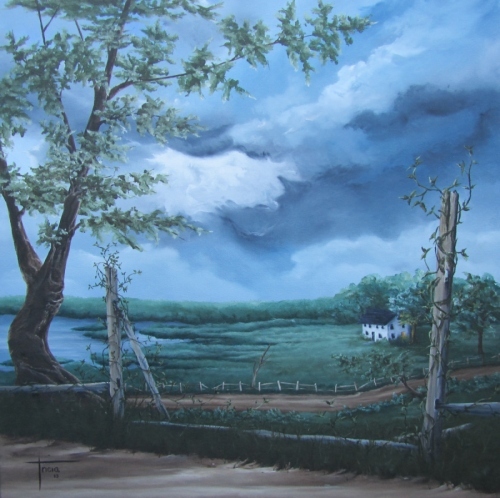 This piece depicts a farmhouse, nestled close to a typical Cape Cod marsh, while storm clouds gather above. The viewer peers down on the scene from the old dirt road which meanders down past the house. I have always enjoyed painting skies. They can be very easy and simple, or they can be infuriatingly difficult and involved. This one was easy! I love a stormy, moody sky. 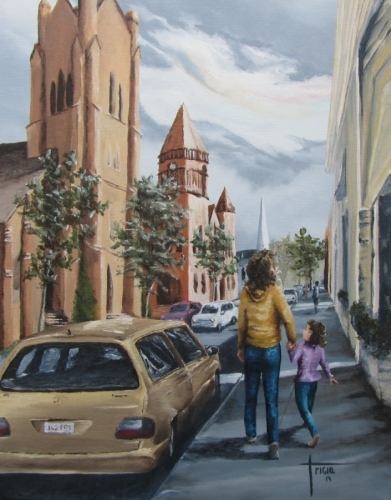 If you would like to see this piece please contact me directly. 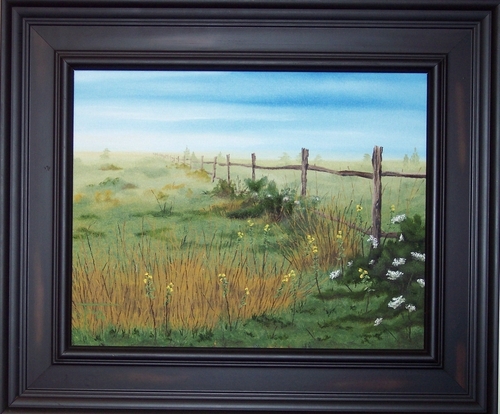 I was thinking about a cool misty morning in a field bursting with flowers & wild life when I painted this one. I like lush flora & fauna. I enjoy thinking about the little animals that might wander through when no one is looking! 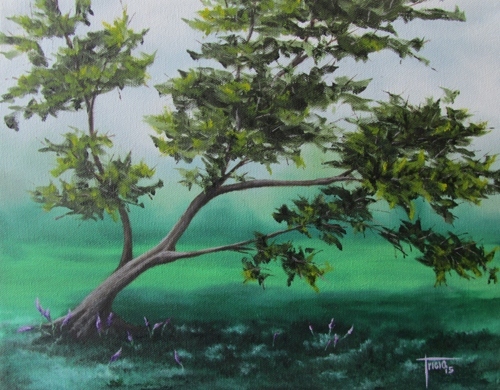 I thought the trees were the subjects of this painting, then I thought maybe the fence. In the end I think the shadows stole the show; making a simple dirt road an intricate thing of beauty. I really wanted to express a feeling of warm 'morning' sunlight reaching into the coolness of the woods. I used warm colors on top of cool colors, as well as blurring and defining the trees (as the sun rays dictated of course). I think you will need a sweater to walk in this forest! 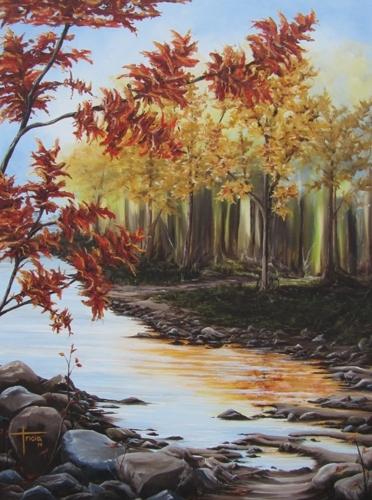 This piece is reminiscent of New England in all it's Autumn grandeur. It is peaceful yet vibrant, neutral yet colorful. 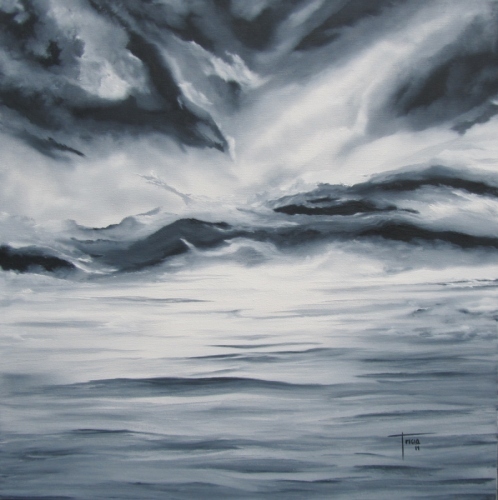 This piece is a dramatic depiction of a beautifully threatening sky hovering over the ocean. 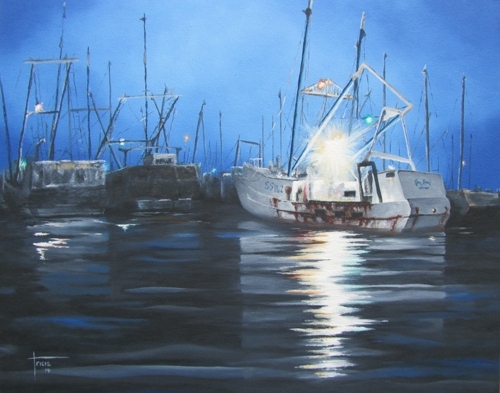 This is a big, fun piece painted solely in black and white. The sky is so scary, so terrifying, yet it is simply lovely. The spot where the sky and the ocean meet has been camouflaged. Only I know exactly where it is! Enjoy.